Dr. Graves goes to FPPT, AVS, and GEC! Welcome to postdocs I-Wei Yang and Yaojhen Yang! I-Wei hails from National Chiao Tung University in Taiwan, and Yaojhen joins us from National Taiwan University. Welcome to the team! Welcome to new graduate student Don Gidon! Don joins us from KOC University in Turkey, and will be working on an a project related to atmospheric pressure plasma and controls under the co-direction of Prof. David Graves and Prof. Ali Mesbah. 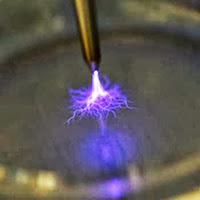 Recent GravesLab alum Dr. Matt Pavlovich publishes "Air spark-like plasma source for antimicrobial NOx generation" in JPhysD: Applied Physics. The postprint will be available here shortly. GravesLab goes to GEC2014! Dr. Graves gave the Allis Prize plenary, Alex Lindsay gave an oral presentation on "Transport Processes from Plasma to Liquids in Convective Systems", and Carly Anderson presented a poster on ROS and plasma-liquid interactions. A paper by Dr. Graves entitled "Oxy-Nitroso Shielding Burst Model of Cold Atmospheric Plasma Therapeutics" is accepted for publication in the journal Clinical Plasma Medicine. The final version is available at no cost through 2015.01.30; the postprint is available thereafter. Welcome to postdoctoral scholar Ranga Gopalakrishnan! Ranga joins us from CalTech, and will be working on an array of projects related to atmospheric pressure plasma and aqueous or biological interfaces. Dr. Graves is teaching CBE 179 - Processing Technology for Solid State Devices. The course material is available in the course wiki, and the lectures are recorded and posted on YouTube. Welcome to visiting researcher Alex Lindsay, from the Shannon Lab at North Carolina State University. GravesLab goes to Japan! Presentations from the 5th International Conference on Plasma Medicine (ICPM5) have been added to the Presentations page. Announcing the creation of PlasMedFeed: an automated RSS feed aggregator for Plasma Medicine–related academic literature. Follow along for the latest publications, updated daily! Announcing the creation of PlasMedWiki: a collaborative knowledge base for the Plasma Medicine community. Contributions and suggestions are welcome!